Repository URLs for deb and rpm downloads have been updated for all repositories, as part of a change that decouples the application that builds your packages (packager.io), from the one that hosts them (dl.packager.io). This is quite a big change under the hood, but all previous repository URLs should keep working (if not, please email ASAP at support@packager.io). Download tokens from private repositories have all been migrated as well. As it stands, the previous URLs will keep being supported for some time, and you will receive an email a few months in advance when a date has been set for their removal. However, you are strongly encouraged to update your URLs in documentation and scripts as soon as possible, since you will not incur additional redirects, and the analytics will also work better if you use the new URLs. Speaking of analytics, the ones currently displayed are frozen while we re-import the previous stats into the new hosting backend. An announcement will be made when they are back to normal. I hope you'll find the revamped UI easier to navigate, and please let me know if you encounter any issues. Packager.io is a hosted continuous integration platform that allows you to build and publish Linux packages for your software, directly from your Github repository, without you knowing anything about deb or rpm packaging. 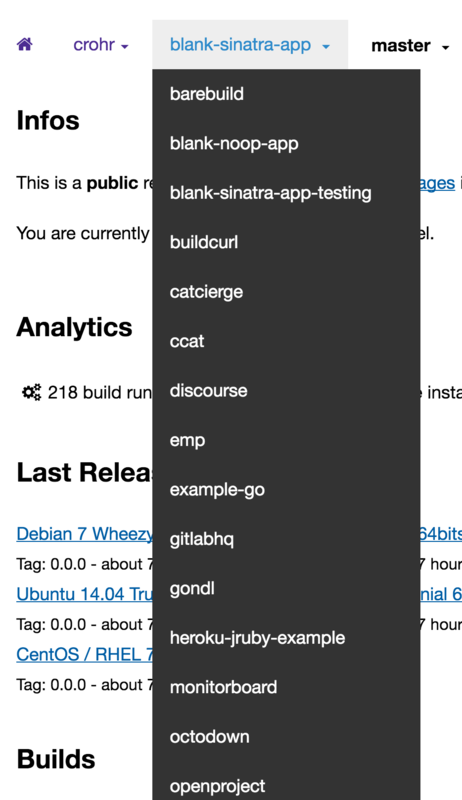 Ruby, Node.js, and Go apps are currently supported, and you can generate and publish public or private packages for Debian 7/8, Ubuntu 12.04/14.04/16.04, RHEL/CentOS 6/7, and SLES 11/12.